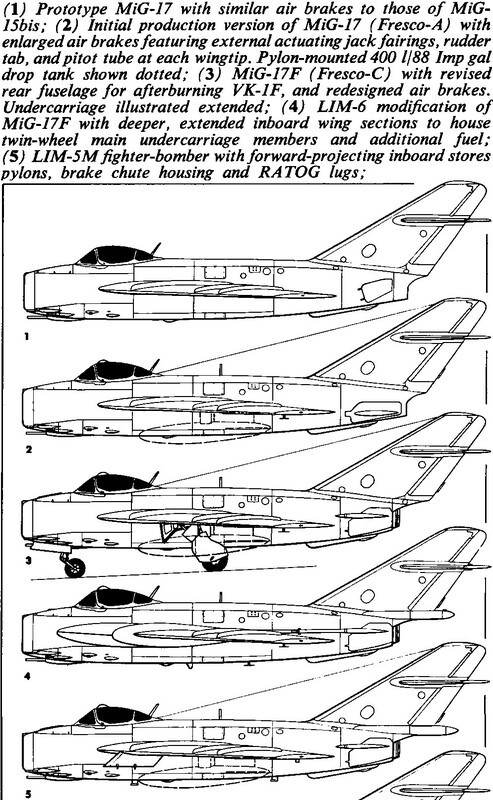 A Soviet modification of the MiG-15bis for ground attack. 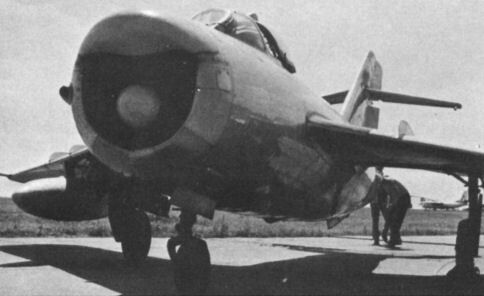 A MiG-15bisT target-tug of the Czechoslovak Air Force. 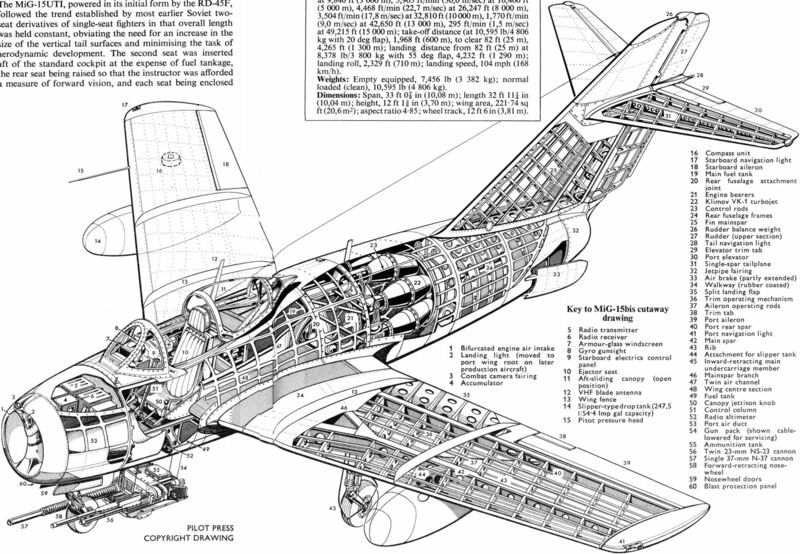 The winch can be seen below the forward fuselage. 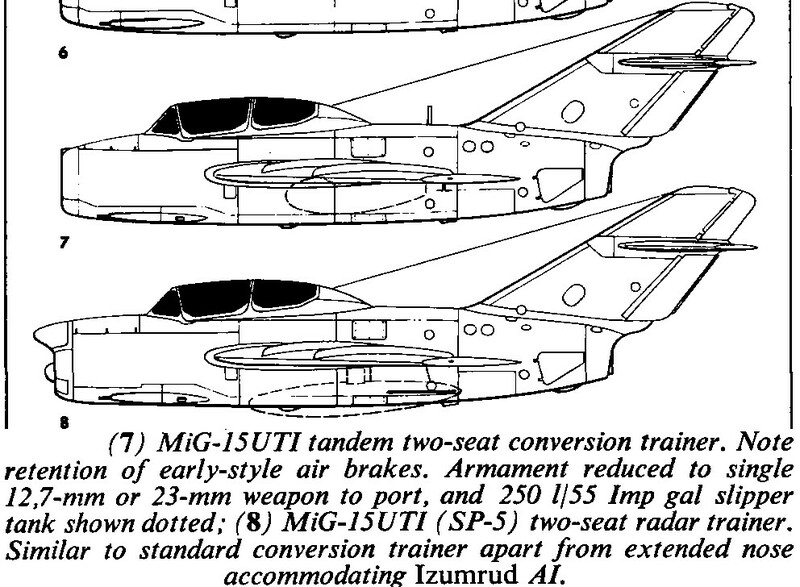 The MiG-15bis, seen in service with the Polish Air Forces as the LIM-2, was probably built in larger numbers than any other fighter of its generation. Identifying features are the IFF post antenna and the radio altimeter aerial beneath the port wing. 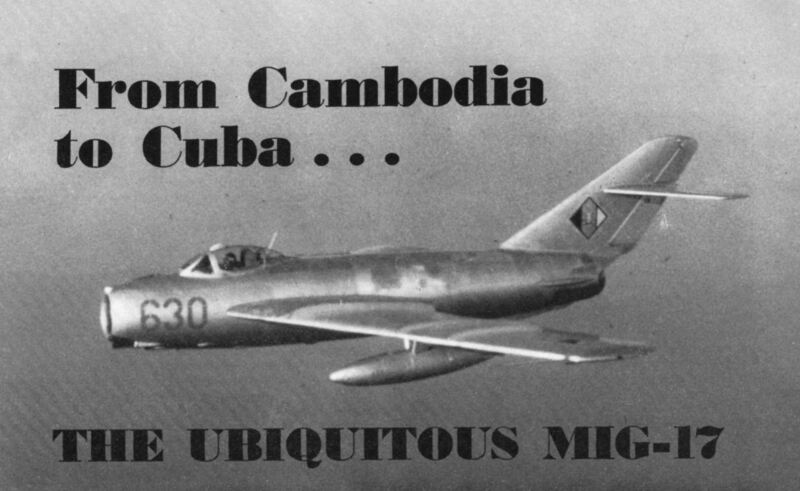 Совершивший первый полет 30 декабря 1949 года, МиГ-15 стал первым массовым советским реактивным истребителем. На снимке - МиГ-15бисР польских ВВС с подфюзеляжным контейнером с фотоаппаратурой. 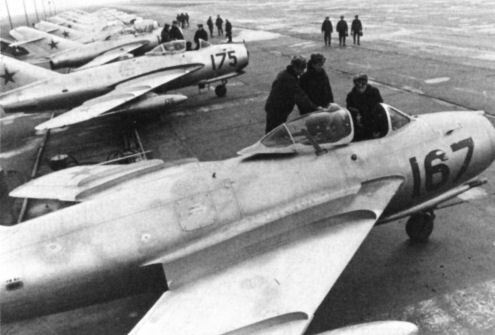 A MiG-15bisR tactical reconnaissance fighter in service with the Polish Air Forces. 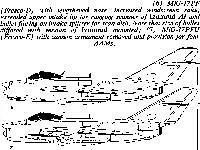 The camera pack may be seen mounted beneath the cannon magazines. 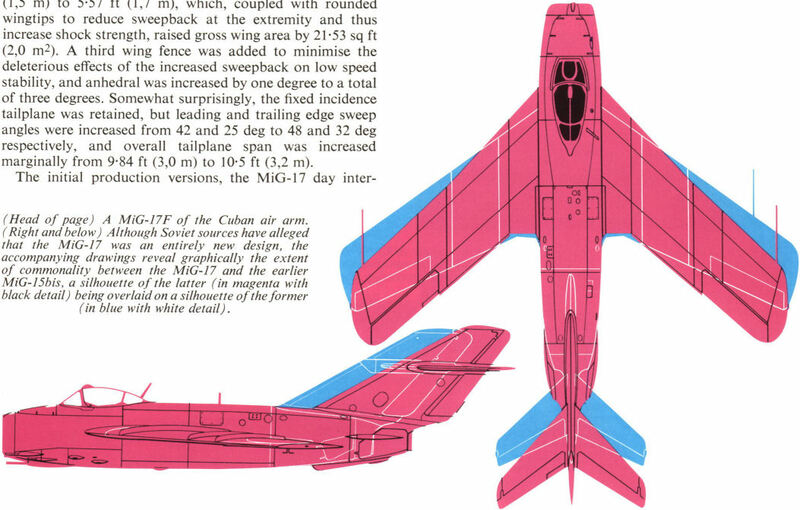 Although Soviet sources have alleged that the MiG-17 was an entirely new design, the drawings reveal graphically the extent of commonality between the MiG-17 and the earlier MiG-15bis, a silhouette of the latter (in magenta with black detail) being overlaid on a silhouette of the former (in blue with white detail). 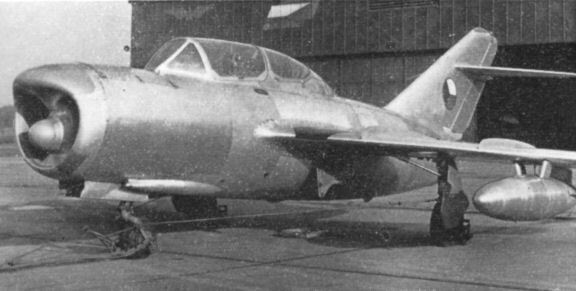 The MiG-17F day fighter which entered production in 1953, several thousand being built in the Soviet Union and others in Poland and China. 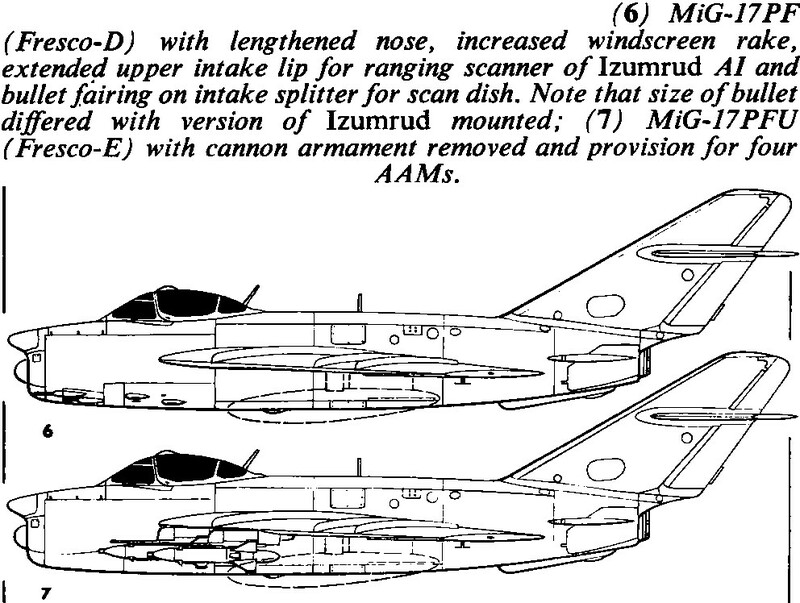 Modified version of the MiG-17F, the LIM-5M. 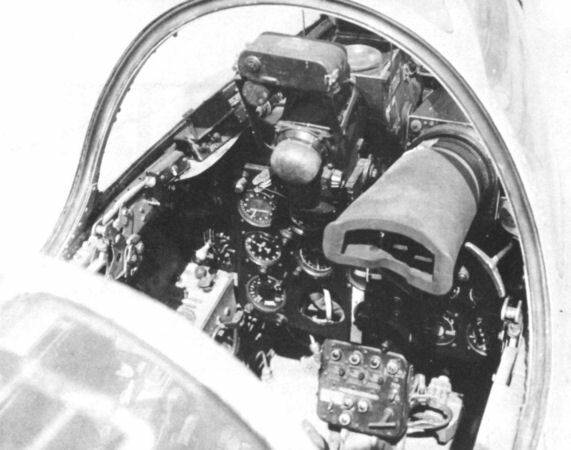 The large brake chute housing may be seen protruding beneath the vertical tail surfaces.